Cholera: Outbreak In Yemen Is A Reminder That This Ancient Disease Is Still A Global Risk : Goats and Soda The latest cholera surge is in Yemen, and Haiti is still fighting the world's worst outbreak. Why does this waterborne disease remain a global health risk? A cartoon from an 1852 issue of Punch shows the unsanitary conditions in London slums, which led to cholera outbreaks. Cholera can kill a person in a matter of hours. It's a severe gastrointestinal disease that can trigger so much diarrhea and vomiting that patients can rapidly become dehydrated. They lose so much fluid that their internal organs shut down. The waterborne disease has been around for centuries, and it remains a global health risk. According to the World Health Organization, there are roughly 3 million cases a year and 90,000 deaths. The worst outbreak right now is in Haiti, linked to cholera brought by U.N. peacekeepers in 2010. Outbreaks are also flaring in South Sudan and Somalia. In countries that have long been grappling with cholera, such as Bangladesh, India and the Democratic Republic of Congo, tens of thousands of people are sickened every year. And now there's concern that cholera could sweep through war-torn Yemen. Doctors Without Borders has reported at least 570 cholera cases in Yemen in the past three weeks. "(This) is extremely alarming. We are facing a reactivation of the cholera epidemic," Nevio Zagaria, the WHO representative in Yemen, told Reuters. "The cause is that there is two years of war .... The water pumping stations are not functioning regularly, and this has an impact on the quality of water." "It's been in the Ganges Delta from time immemorial," says Dr. David Sack, a professor at the Bloomberg School of Public Health at Johns Hopkins University in Baltimore. "It began spreading to the Western world in the early 1800s. With travel and transport ships going back and forth to India, it spread through Russia, through Western Europe. It came to Baltimore. It came to New York, Philadelphia in the mid-1800s. It was a disease that affected large parts of the world." In the 1800s, cholera killed millions of people as it spread around the globe. "At that time, we didn't know what caused it," says Sack, who has spent much of his career studying the disease. "We didn't know how to treat it. A case of cholera that is untreated has a fatality rate of about 50 percent and that's what was happening in Philadelphia, New York, Baltimore." Theories about the cause of this horrendous illness were plentiful. Foul air rising from sewers and piles of rotting trash was a leading suspect. Some church leaders said it was retribution by God for sinful behavior. Poison in the soil was suggested as a possible culprit. 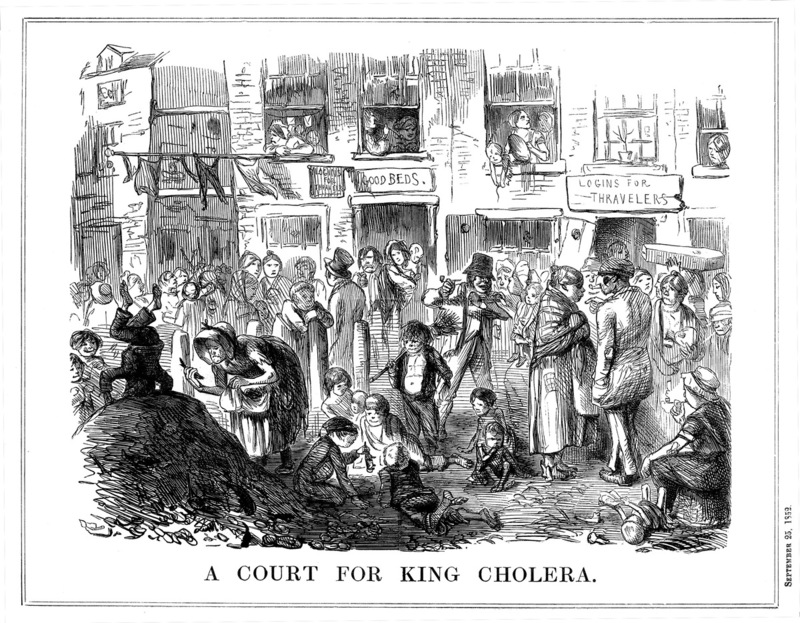 There appeared to be a link between cholera and filthy, overcrowded urban slums. In the 1850s, an English doctor named John Snow became a legend of public health for figuring out that an outbreak in the Soho neighborhood of London was linked to a single drinking water source. Snow is credited with stopping the raging outbreak, which claimed 10,000 lives across London, by taking the handle off of the Broad Street pump. Snow argued correctly that water contaminated with sewage was spreading the illness from one resident to another. But he still didn't know exactly what the water was contaminated with. He theorized that it might be tiny parasites or germs or some "poison" that was able to reproduce in the environment. Around the same time an Italian scientist, Filippo Pacini, identified the bacteria that causes cholera. But his discovery wouldn't be widely accepted until decades and millions of deaths later. Sack at Johns Hopkins says cholera is now a treatable disease so long as the patient gets medical attention quickly. "A patient with cholera should never die," Sack says. "If they get to a treatment center in time, if they still have a breath, we can save their life." There is no cure or antidote or magic pill. Treatment consists of simply keeping the person hydrated. In severe cases, patients may need to be given fluids intravenously. If they are capable of drinking, they can also be treated with oral rehydration fluids, basically souped-up sugar water. The current outbreak on the island of Hispaniola, which Haiti shares with the Dominican Republic, began in 2010. Sack says it is of historic proportions. "It's huge," he says. "We haven't ever seen something quite like this [in modern times]." So far the Haiti outbreak has sickened roughly 800,000 people and killed more than 9,000. Cholera spread rapidly on Hispaniola because of two factors. First, the population had no immunity to the disease because it had never been seen there before. And second, Haiti's drinking water and sewage infrastructure is in a dreadful state. For many Haitians, infrastructure to deliver clean drinking water and adequately treat human sewage simply doesn't exist. To put this outbreak in perspective: In 2016 in all of the Americas, roughly 30,000 cholera cases had been reported to the Pan American Health Organization, the regional office of WHO, from four countries. One case was in Mexico, one case was in Ecuador, and the rest were in Haiti or neighboring Dominican Republic. Is an end even in sight? There is an oral vaccine, but Jean-Luc Poncelet, PAHO's representative in Haiti, says the bigger issue is clean water. "Vaccine is not the solution. It is one tool that we have to add to the ones we already have," he says. Poncelet says Haiti unfortunately is a long way off from eliminating cholera. "Until Haiti does have access to clean water and sanitation," Poncelet says, "eradication will be extremely difficult if not impossible." Worldwide, the idea of eradicating cholera is so far off that it isn't even on the agenda of global health officials. The final chapter on cholera's long history will only come about when living conditions improve to the point that almost everyone has reliable access to clean water.